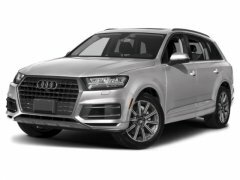 Find a great sale price on this 2019 Audi Q7 Premium Plus 55 TFSI quattro at Keyes Cars in CA. This 2019 Audi Q7 is located at our State dealership in California. We serve the cities of Van Nuys, Valencia, Woodland Hills, Mission Hills, and Los Angeles. So if you're looking for a great price on this 2019 Audi Q7 Premium Plus 55 TFSI quattro or just looking to get an auto loan for the vehicle you want... you've come to the right place! Keyes Cars. The 2019 Audi Q7 is wide-ranging beauty. Progressive design and timeless beauty are the hallmarks of the Q7, creating a striking presence on both city streets and dusty back roads. Details such as the powerful wheel arches emphasize the vehicle’s standard quattro all-wheel drive system, creating a look and feel that can take you to places far and wide. The standard power tailgate with programmable opening-height adjustment can feature an available hands-free opening function. Versatile cargo space with a generous 71.6 cu. ft. capacity with the 35/30/35 and 50/50 rear seatbacks folded down – or space for up to seven passengers when seatbacks are upright. The Q7 is driven by your choice of a 2.0-liter turbocharged or 3.0-liter supercharged TFSI engine offering 252hp and 333hp respectively – linked to an eight-speed Tiptronic transmission. Legendary quattro all-wheel drive enables high- precision, dynamic handling through active torque distribution to the rear axle while providing enhanced directional stability when cornering, while Audi drive select makes it possible to pre-select up to seven driver selectable modes – Comfort, Auto, Dynamic, Individual, Offroad/Lift and Allroad. This SUV can really haul with an incredible 7,700 lb max tow rating. The Q7 offers a range of convenient features, including a fully digital 12.3in instrument display, MMI all-in-touch with handwriting-recognition technology, smartphone interface, Audi connect, built-in Wi-Fi, head-up display and premium audio system. You’ll also find a comprehensive suite of safety features such as pre-sense technology, active lane assist, collision avoidance assist, rear cross traffic assist, turn assist, adaptive cruise control with stop and go and traffic jam assist and night vision assistance.